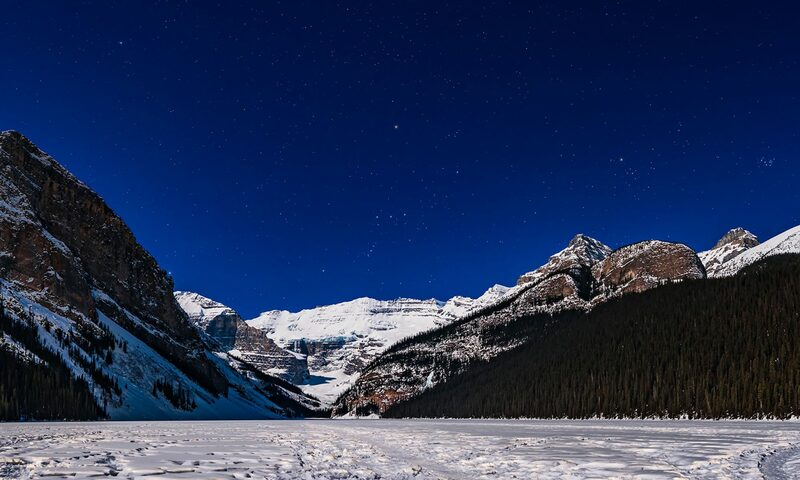 The Milky Way runs through the middle of the Winter Triangle, three of the bright stars of the northern winter sky. At right is the familiar pattern of Orion the Hunter. But if you take his shoulder star, the orange-looking Betelgeuse, you can form an equilateral triangle with Sirius below centre and Procyon at upper left. The trio are sometimes called the Winter Triangle. The pattern seems obvious here but with so many other bright stars in the winter sky, I’ve never found the pattern too obvious. But in this image I’ve chosen to nicely centre and frame the Triangle. I’ve also increased the contrast and saturation to emphasize the wealth of nebulosity that fills this area of the Milky Way. 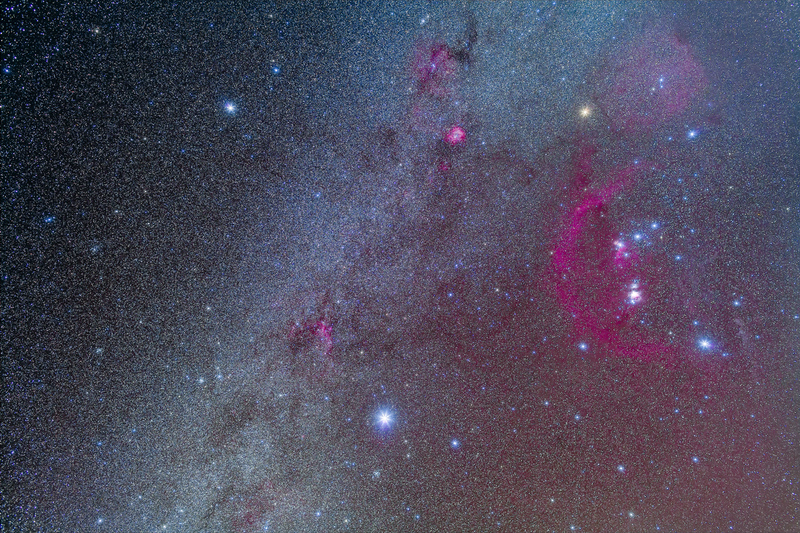 Streamers seem to reach out from Orion and connect to the reddish Seagull Nebula above Sirius, and also to the round Rosette Nebula above centre. 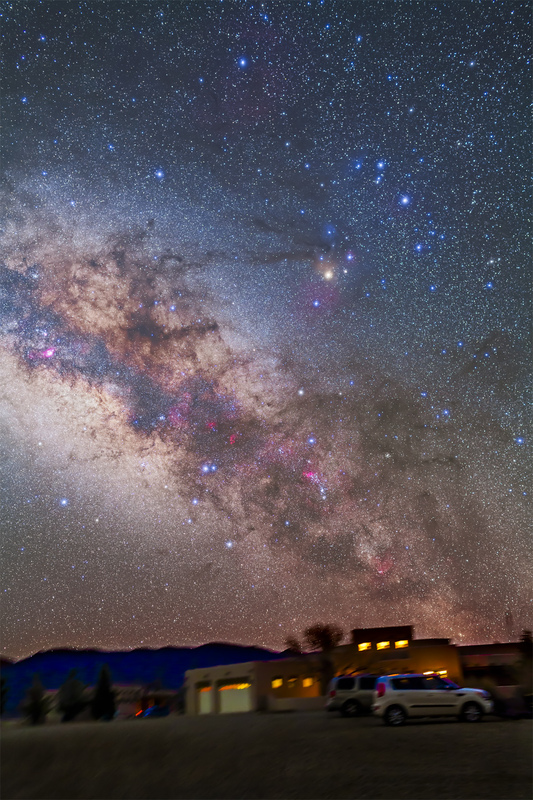 The background sky west of the Milky Way under Orion is filled with a faint red glow, in contrast to the neutral black sky east (left) of the Milky Way. I shot this last night, from New Mexico, on our last good clear night on a week-long observathon. This is a stack of 5 exposures, each 8 minutes long, plus two other exposures shot through a diffusion filter to add the glows around stars. I used a 35mm lens and a filter-modified Canon 5D MkII camera, riding on an iOptron Skytracker tracking platform. This is one of the few constellations that looks like what it is supposed to be – a desert-dwelling scorpion. This is Scorpius in his native habitat of the desert. Here, from the latitude of southern New Mexico, he is standing on end, his claws at top, his curving tail and stinger at bottom. The bright yellow star is Antares, the heart of the scorpion, embedded in a colourful mix of magenta, yellow and blue nebulas. Scattered along the Milky Way in the tail of the scorpion you can see several magenta emission nebulas shining by the combined red and blue light of hydrogen atoms. What I love about this area of sky is the lacework of dark foreground nebulas, and the contrast between the bright star clouds and dark lanes of stardust. At centre left is the Dark Horse, the darkest part of which also carries the name Pipe Nebula. I shot this image this morning at about 5 a.m, in the hour before the sky brightened with dawn twilight. This is a stack of seven 3-minute exposures with a 35mm lens, including two exposures taken through a diffusion filter to add the accentuated star glows. The ground details come from just one of the exposures. As it’s been all week, the location is the Painted Pony Resort in southwest New Mexico.